Recycled telephone wire (14 3/4" w x 3 1/2" h). Turquoise multicolor. Exact design may vary. Recycled telephone wire (7 3/4"w. x 3 1/4" h.). Green multicolor. Exact design may vary. Red multicolor. Exact design may vary. Small Flared Bowl baskets available in assorted bright colors and patterns, similar to samples above - available with or without the black color. Small baskets available in assorted bright colors and patterns, similar to samples above - available with or without the black color. Mini size baskets available in assorted colors and patterns (samples above). Small Flared Bowl baskets available in assorted patterns, similar to sample above. 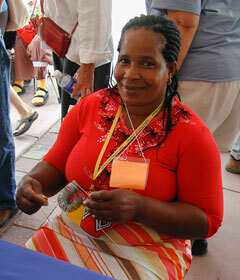 Nompumelelo Mkhize - South Africa. By Nompumelelo Mkhize - South Africa. Recycled telephone wire (6 3/8"w. x 2 1/2" h.). Small size baskets available in assorted patterns (samples shown). 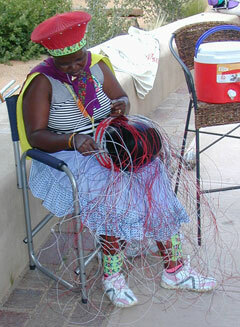 Zodwa Maphumulo works on a "hardwire" basket in Santa Fe, July 2005. 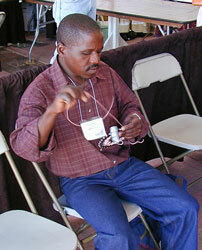 South African Imbenge basket artist Vincent Sithole demonstrates his art on a "hardwire basket" at the International Folk Art Market in Santa Fe, NM, July 2004. 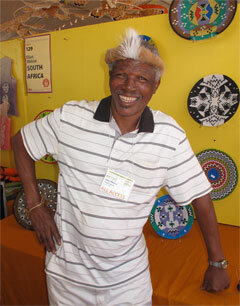 South African Imbenge basket artist Jaheni Mkhize demonstrates "soft basket" construction in Santa Fe, July 2005. 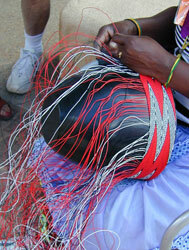 Detail of Jaheni Mkhize at work on a"soft basket".